What is a web series? That’s very simple. A web series is like watching a regular television series except you can watch it on the internet. The first advertiser supported web series was created by Scott Zakarin in 1995 and was called The Spot and was kind of like a Melrose Place on the internet. Then came Homicide: Second Shift which was a pioneering Internet web series that tied into the TV show Homicide: Life on the Street. Basically, the internet became a new home for independent producers. In the late 1990’s, with broadband and improved streaming technology becoming more accessible to the general public, independent producers were able to create low budget series through the internet. This would eventually lead to major television stations following the trend and promoting their own TV shows through the web. The popularity of web series has grown to the point where there are several web sites devoted to hosting a hub for fans of the genre to have access to their favorite shows. In 1995, the Webby Awards were established to recognize top web series in comedy, drama, and reality categories. The International Academy of Web Television was founded in 2008 with the mission of organizing and supporting the community of web television creators, actors, producers and executives. The Streamy Awards, which awards the web television and web series content, picks winners based on the Academy’s findings. There are a lot of sites out here for the webisode junkie to bit into. 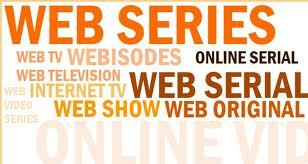 I pick the Web Series Channel site at www.webserieschannel.com because it’s easy to use. If you go to the Web Series tab you will go to a page that lays out all the shows by genre and then by name in alphabetical order. In the middle of the Home page, you will find the new web series that are out right now. Towards the bottom of the page you will find the editor’s picks and they are as follows: Aidian 5, a detective mystery; Homeschooled, a high school comedy; Wendy, a girl coming of age and A Day In The Life, which follows a typical day in somebody’s life. The Web Series Channel also gives you news and interviews relating to web series specific topics and interviews with some of your favorite web series actors, producers and directors. Do yourself a favor and check out this site or one of the others that provide an outlet for independent filmmakers. I’m going to scroll through the directory and find a show to my liking. See you next week.